The Hong Kong Polytechnic University (PolyU)'s proprietary optical fibre sensing technology in monitoring railway has been adopted overseas, for the first time, in metro lines in Singapore. Apart from installing an optical fibre sensing network in tracks to monitor the trains, sensors are also installed in in-service trains to monitor the tracks on which the trains run. 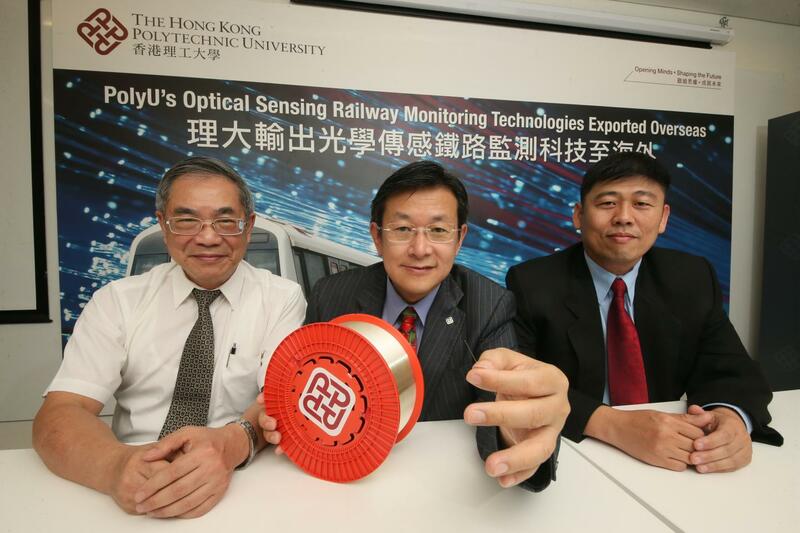 PolyU is the first in the world using fibre optic sensors in in-service trains for continuous monitoring of the tracks. Compared with the prevailing means of regular check-ups for tracks after close of traffic, the new system provides continuous, in-service monitoring of tracks. This enhances service reliability through quick identification and rectification of defects. This new maintenance practice is expected to become a trend in the railway industry globally as it can best meet the ever-rising expectations for service reliability. The use of optical fibre sensing network installed on tracks for monitoring trains, and in the trains for monitoring tracks, is also a most efficient mode of maintenance for two of the most mission-critical components for a railway. This innovative approach won the Third 2014 Berthold Leibinger Innovation Prize in Germany. Through collaboration with various railways on the application of fibre optic sensors, PolyU has become a pioneer and leader in the smart railway condition monitoring technology. A total of 6 groups of sensors will be installed in tracks and trains of the East West Line and North South Line of SMRT which are the two busiest lines in the metro network of Singapore. Professor Tam Hwa-Yaw, Chair Professor of Photonics and Head of Department of Electrical Engineering, PolyU, said, "PolyU is proud to have exported its optical fibre sensing network to provide unprecedented health monitoring for mission-critical components in metro lines overseas. This PolyU technology will help enhance the performance of metro systems through an advanced predictive monitoring and maintenance regime, which is now the best practice in the railway industry and a global trend. This also shows how an academic institution in Hong Kong can develop leading technology in the world through collaboration with the industry." Dr Tan Chee Keong, Deputy Director of SMRT, Singapore, commented, "SMRT is most delighted to have PolyU's advanced railway technology installed in our metro lines. With much foresight, SMRT is the first in the world to have adopted this preventive monitoring system, enabled by the cutting-edge railway technologies pioneered by PolyU. I am sure this optical fibre sensing network installed in both the tracks and running trains will enhance the operation of our metro lines." An agreement was signed with SMRT in February 2016, and a trial run was completed successfully in June. The permanent monitoring system is now being installed in the two lines, to be completed in early 2017. PolyU will provide training to SMRT staff in operating the system, while the data collected during monitoring can also be sent to PolyU real-time for analysis when needed. In addition, PolyU will also provide maintenance and technical support to SMRT for a period of five years after the commissioning of the system.